Picture Paradise. Now Times it by a Thousand. That’s what you get when you visit Tahiti. Most people in the Western world spend late November to early December prepping for Christmas. Not I. Instead, I was delighted, no, ecstatic, to be invited on the trip of a lifetime to the islands of Tahiti. Yes, you read that right. 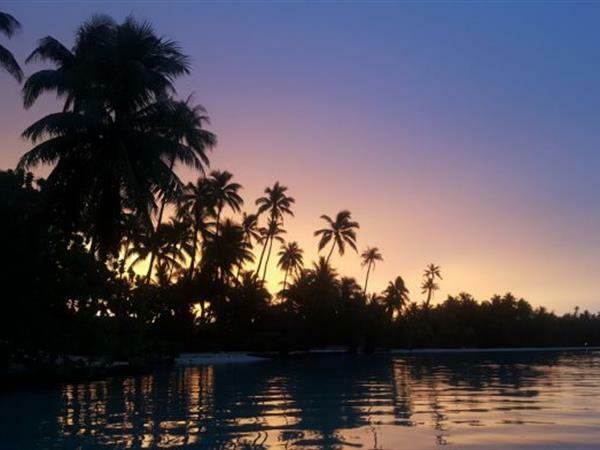 Tahiti: perhaps the most remote, if not the most exclusive, destination in the world. The heaven of honeymooners, a pearl paradise and so much more, as we were to find out. A stereotypical view would be that Tahiti and its islands (there are 118 in total, including the infamous Bora Bora) is purely a couple’s playground. Well, it is an idyllic getaway, and certainly offers the most romantic sunsets I’ve ever seen. Yet Tahiti is also the ultimate destination for adventurers and thrill seekers alike, and I’m a little bit of both. Our journey began with a quick trip to Paris. It’s the nearest stepping stone to Tahiti, via LA, offered by national carrier Air Tahiti Nui (‘Nui’ means ‘big’ in Tahitian. It has the big planes that travel long distance – and we mean looong distance. Air Tahiti without the ‘Nui’ is the little local airline that helps you hop from island to island). I’ll be honest: It’s a long journey. A good 36 hours when you account for the layover in LA. But it’s worth every second and it really drives home how far away you are from everything. You’re bang smack in the middle of the South Pacific. The term ‘getaway’ has never been so true. From Tahiti, we hopped on a flight, then hopped on a boat, then caught another boat to our most remote location yet (yes, it is possible to find a more remote spot, even after travelling 36 hours from the UK!). The boat brought us to my favourite hotel of the whole trip: Le Taha’a Island Resort & Spa, situated on the tiny Motu Tautau islet. Why was it my favourite? Two words: Overwater Bungalows. We arrived in a haze of rain. You tend to get a lot of that in Tahiti, although it’s never cold rain and, truth be told, the rain really adds to the atmosphere, as you can see below. But imagine my delight, as a bona fide sun-worshipper, when those twilight showers were transformed into a fairy-tale rainbow flanked by a stunning multi-coloured sunset only a few hours later! Believe it or not, these photos are completely unedited, because nature needs no filter. I was literally lounging in a hammock over the sea while this took place. It was truly one of the most magical moments I’ve ever experienced. Le Taha’a also puts on regular live entertainment, with traditional folk songs and dancing – including fire dancing! If you’re feeling brave, it’s also a good spot to learn some moves in a bit of audience participation. During our two night stay, we took advantage of the resort’s proximity to Taha’a itself, booking onto an ATV Quad tour with Ranipoe Tours. The couple who led the tour were major survivalists – the kind of people you’d want to be shipwrecked on a deserted island with. We learned all about the medicinal properties of various flora and fauna, as well as how locals use bamboo to make rope. My favourite part was holding the gorgeous, fragrant ylang yang flowers, which are used to make Chanel no.5! We also visited a traditional family pearl farm where we learned that it can take three years for oysters to produce their first harvest. Following the educational part of the tour, we then commandeered a couple of shiny red jeeps and shot off to the top of a mountain. It was then, during the off-road leg of the trip, that the tropical heavens decided to open. We may as well have slid back down that mountain like that natural waterslide it became. I have never felt so ‘off-road’ in my life! To say it was an experience would be an understatement. More than a little bit soaked, we rounded the tour off with a much-welcome lunch stop, joining a local family for a meal on the cusp of civilisation, right by the waterside under a canopy of shell-studded netting.